I would highly recommend refinishing old cabinets instead of replacing them and I would also recommend doing it yourself. You will save literally hundreds, even thousands, depending on how many cabinets you have. Since we moved into the Minnesota Project Home, we have discussed if we want to attempt to refinish the cabinets. The color of the wood isn't our style, so we have been trying to decide if we should paint, stain or rip them out altogether and replace. I finally became tired of this indecisiveness and decided we would take the plunge and paint one bathroom vanity to see how we like it. This was probably one of the best cosmetic DIY decisions we have made in five years of home remodeling. I would highly recommend refinishing old cabinets instead of replacing them and I would also recommend doing it yourself. You will save literally hundreds, even thousands, depending on how many cabinets you have. Plus, it isn't all that difficult and depending on the size of the cabinets this project can take just a few hours. 1) Remove all hinges and hardware with your screwdriver or drill. 2) If you have any unwanted holes (especially if your new hardware is a different size), fill them in with your Wood Putty. 3) Sand, sand, sand. You don't need to strip anything, but you want it good and sanded down. 4) Wipe everything down with Mineral Spirits. We also vacuumed before using the Mineral Spirits. You want to make sure all the dust/old residue is gone before you start painting. 5) Tape off any areas (floor, walls, etc.) and now you are ready for the fun! After some trial and error (did I mention we have completed painting five cabinet sets now? ), we found the easiest painting method is to first go with your mini roller and roll the paint on. When you are rolling, make sure to go slowly so you get minimal air bubbles. It helps to stay in one direction with your roller. Next, take your paintbrush and do smooth, even strokes in the crevices and areas the roller can not hit. Repeat the roller. Let dry and decide if more coats are needed. With the black paint we were done after two coats with the roller and one with the paint brush, but with white paint it took four coats of roller and two with the paint brush. 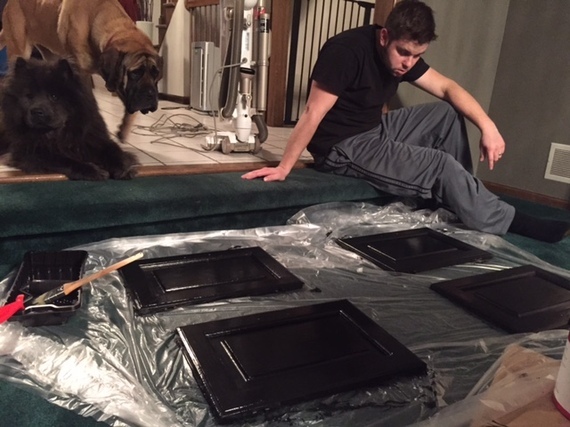 You will want to put the canvas down and lay the cabinet doors on them (remember to paint edges and both sides, it looks much more finished). Then watch paint dry. Literally! The final step is to screw on the new hinges and hardware and you are done! 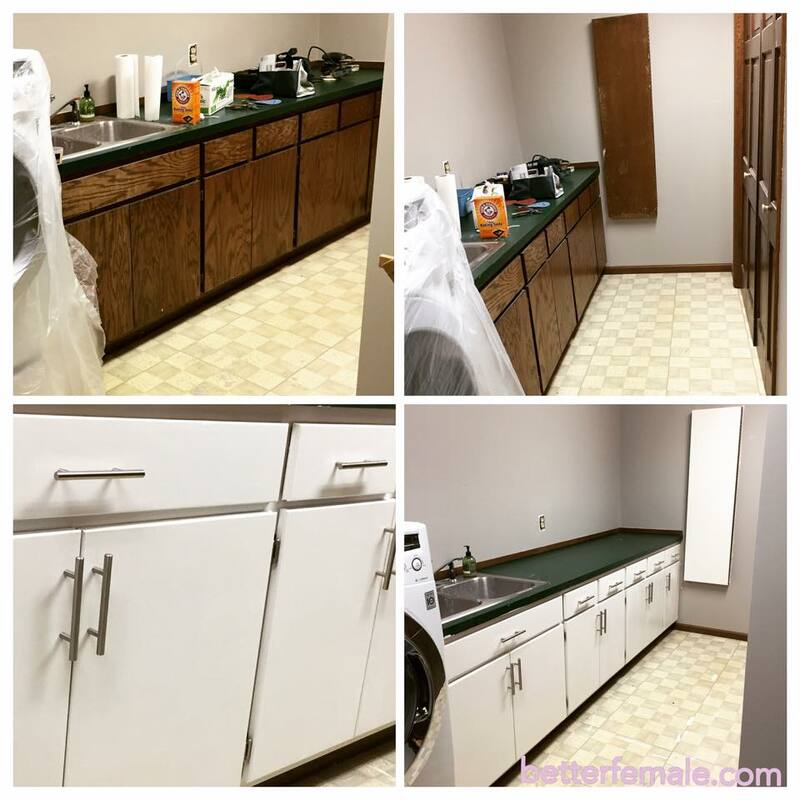 Below is a picture of the before and after of our laundry room, one of five rooms we have done this project in. So how much does it cost and how long did it take you ask? Each cabinet is in the ballpark of costing $100, which was mainly the hardware and hinges. The cabinets done in black took about 6 hours and the white cabinets took about 8 hours. We did them over the course of several nights when our kiddos went to bed. To give you perspective on the cost, we were given a quote for about $750 per vanity. So yes, time and money well spent here. What do you think of the updated cabinets? Have you painted cabinets and have any tricks to share? We can not wait to get new countertops and floors installed to complete the look!